As you can see by the photos this is a beautiful studio located on the rear part of or section at our holiday home here in Whangamata. 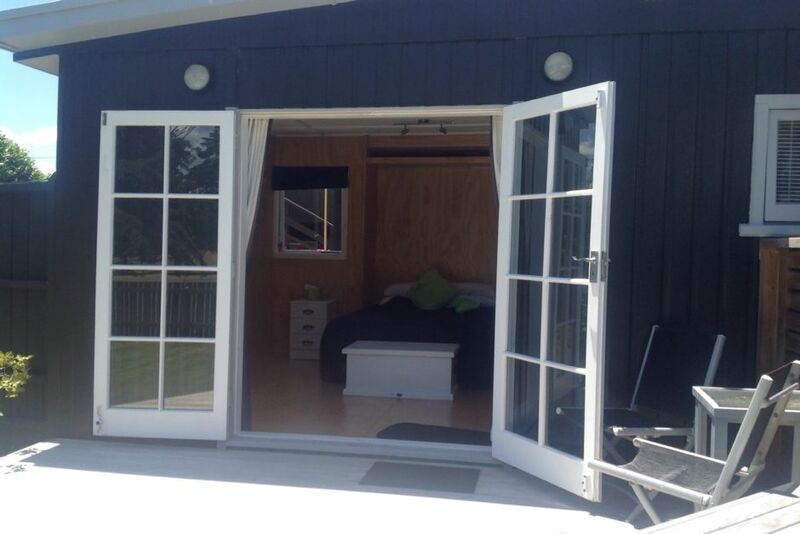 Fall out of bed through the french doors onto your own deck over looking the golf course. Read a book or have an afternoon drink under the sail on the deck. Use the gas BBQ for that special evening meal. Off for a swim just an easy 5 minute stroll to the main patrolled beech then back for an out side shower. Bring your own beech towels. If you like golf then as you can see we are located down the 4th fairway so that is well catered for. Book now you won't be disappointed. Smoking allowed outside only, no pets, unit suitable for two people only,no parties,Beech towels not provided and please don't use bath towels at the beech. An absolute little gem.Normally when coming to Beach Hop we have to bunk down in shared accommodation but this was so so much better.Self contained,private,great parking,central,beautifully appointed,comfy bed and so clean.So nice to have a modern bathroom all to yourself and a well equipped kitchen.Great views across the golf course,just couldn't fault really it.So ideal for BH. Had everything you needed for a comfortable holiday.The only thing missing was a toilet roll holder.Bit of a mystery that one. Sandra, even though away during our stay, provided detailed instructions and we were well looked after..Definitely would come again and we totally recommend this property..
My Wife & I enjoyed 2 nights, it was perfect for our weekend away. Great place to go for a quiet weekend away. The property is compact, clean and well appointed with relaxing views over the golf course. The beach is a short walk away and a few minutes drive into the town. Highly recommended for a couple who just want to get away for a break. 5 minutes from the beach. Lovely outdoor deck with a BBQ. Well kept and functional space. I would highly recommend to anyone and we will be back!